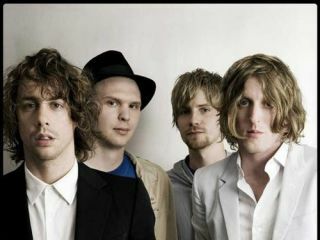 Razorlight record third album Slipway Fires "onto tape"
Razorlight have announced details of their third LP: Slipway Fires. The first single Wire To Wire just had it's radio debut and frontman Johnny Borrell has spoken out about the album's 'back to basics' recording process. "We recorded onto tape, the whole thing took about six weeks," Borrell told BBC 6 Music. "We wanted to make a record without any studio trickery, without too much production." If the piano-driven ballad Wire To Wire is anything to go by, Slipway Fires will certainly be a much more stripped down affair than 2006's self-titled second album. It's different, but might not win back fans of 2004's Up All Night. Slipway Fires gets a full release on 3 November.